Polyurethane foam exists in a number of different forms, but for many it may be more familiar either as the ready-made and rigid sheets (similar to styrofoam) and useful for sculpture or surfboard-making .. or as the instant expanding foam sold in canisters for repairs and insulation. The interior foam in Kapa-line foamboard is also a very fine-grade rigid polyurethane foam. But since I’m writing this within the ‘materials for casting’ section, I’m only concerned here with the expanding foam. I’ve yet to try any of the versions sold in DIY stores though. 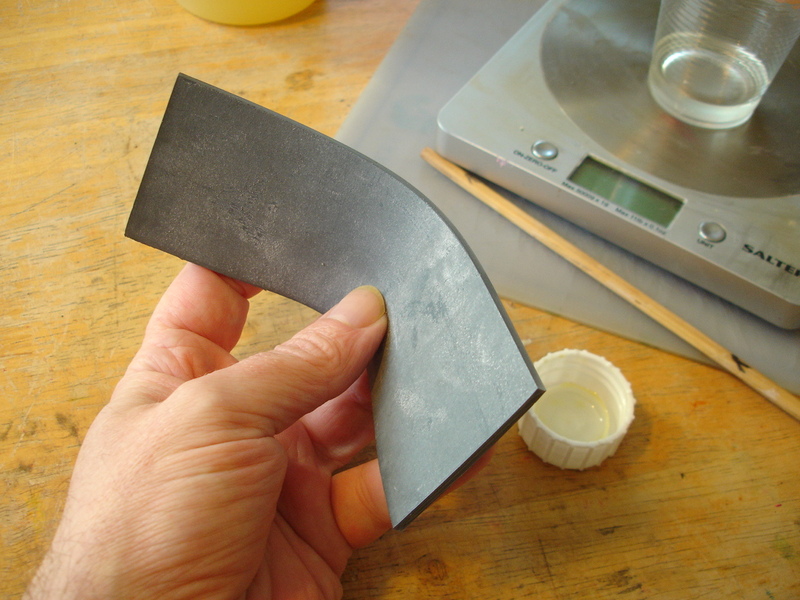 To be able to control it properly enough to use as a casting material it needs to be available as a liquid, in two parts, which can be carefully portioned and properly mixed, and which allows just a little interval of time after that before it starts expanding . Luckily it is available and there are two versions .. one which sets rigid like the sheet foam, and another which remains flexible like ‘cushion’ foam. Either flexible or rigid foam can be used to fill out hollow castings done in other materials to give them much more strength while keeping them very light. With the flexible foam castings can be made in rigid moulds i.e. plaster as long as the plaster surface has a suitable release coating such as Vaseline. The ‘foaming’ may not be consistent throughout and imperfections to the surface should be expected. Polyurethane liquids generally have a recommended shelf life of under a year, but I recently made a test with this flexible polyurethane foam bought at the end of 2012 .. so, more than two years old .. and it worked perfectly! For more advice on disregarding ‘shelf life’ have a look at the start of the ‘quick view’ comparisons page in this section. I always write the date or period when I buy materials, plus reminders if anything needs special handling .. as with part ‘B’ of the mixture here which needs to be shaken because the ingredients separate after it has been standing for some time. This is common with resins especially those that are pre-filled. Another thing .. not only common, inevitable .. is that the cap or lid for the ‘hardener’ component (usually part ‘B’) gets stuck because traces of the liquid crystallize. Something which has never failed me so far even with the most stubborn screw-caps is a strip of tough rubber to grip around the cap while turning. 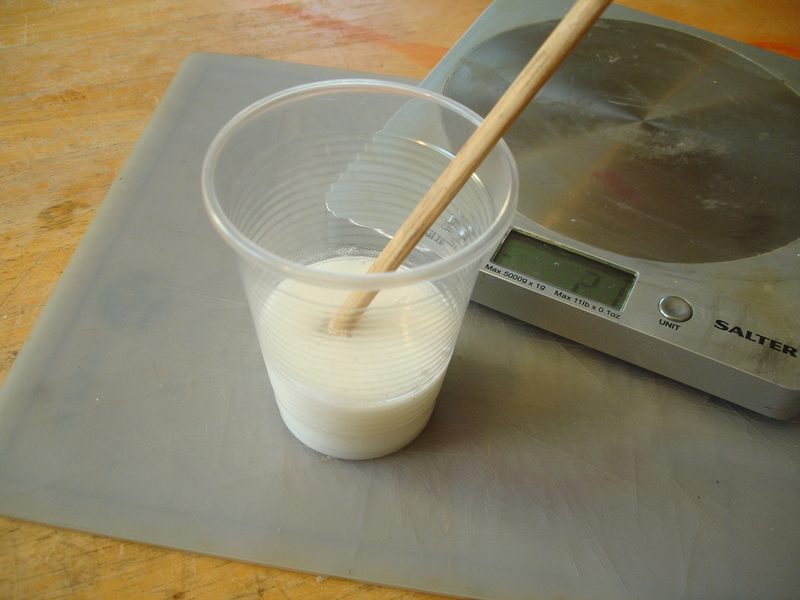 As with resins, polyurethane foams consist of two component liquids which are mixed together in a set proportion by weight, so having a good digital kitchen scales is essential. With this one from Tiranti the ratio is 2:1 part ‘A’ to part ‘B’. 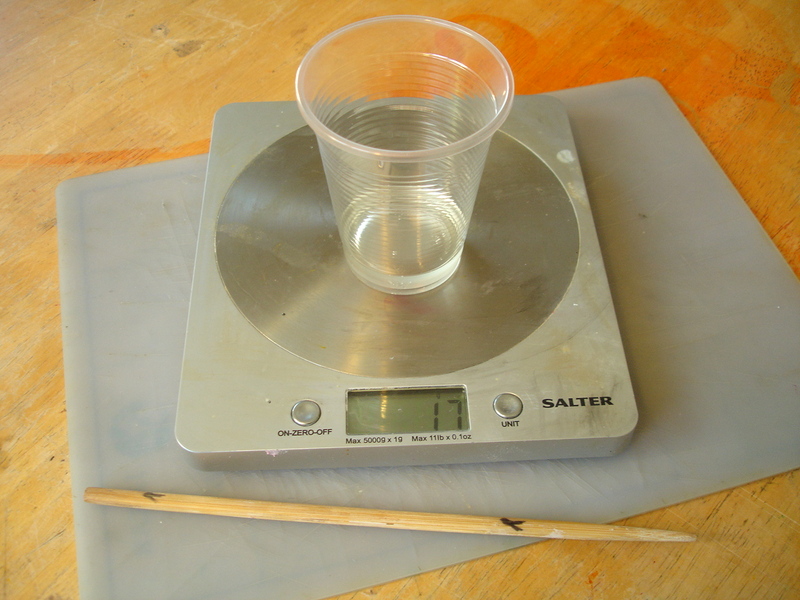 But in addition to being able to weigh accurately one also needs to judge the volume in this case, to be able to dose the right volume of liquid needed to completely fill the mould when it expands. 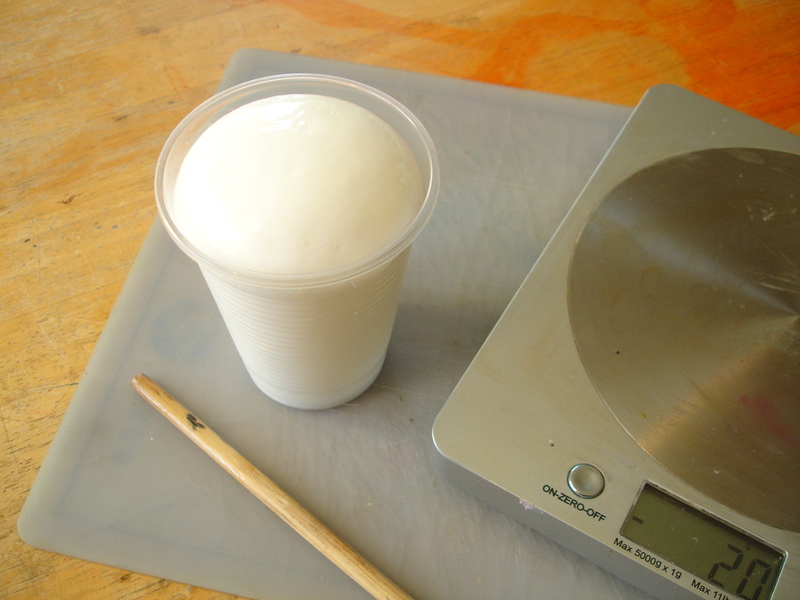 For example if the expanding foam has to fill a volume of 1,000 cubic centimetres (equivalent to a 10cm cube) and the foam is expected to expand up to 5-6 times its original liquid volume, then dividing 1,000 by for example 4.5 should ensure that the mould is filled, with a little surplus. This gives us close to 222 ml of liquid needed, of which two-thirds of the weight is part ‘A’ and one-third part ‘B’. So let’s say we need 148ml of part ‘A’ and 74ml of part ‘B’. We must now find out what these would weigh. Luckily the SG (specific gravity, written as the weight in grams of 1 cubic centimetre of ml of the substance) is often given on the containers. If not it will be on the MSDS (Material Safety Data Sheet) available online from the manufacturer or supplier. 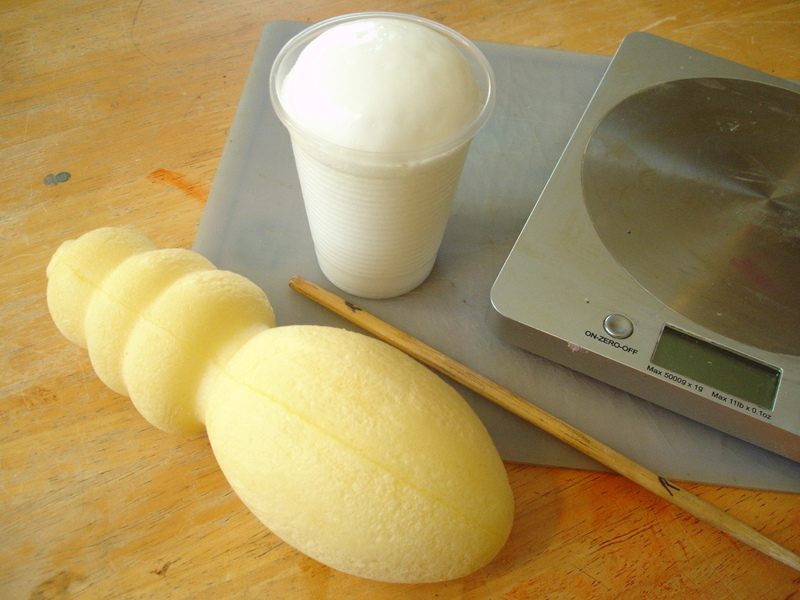 The SG of part ‘A’ of this expanding foam is 1.05 so 148ml would weigh 155.4 grams, and the SG of part ‘B’ is 1.13 so 74ml would weigh 83.62 grams. We need to round these figures off a bit but also adjust them back to a 2:1 ratio .. 156 grams of part ‘A’ to 78 grams of part ‘B’. Below, I didn’t need to make a specific volume calculation in this case because I was just testing whether the material still functioned normally. I poured an arbitrary amount of part ‘A’ .. 17 grams .. into the cup first, then 10 grams of part ‘B’, a little more than half the amount. I did this because I’ve come to expect that with ‘old’ materials it’s the catalyst that’s most often affected, becoming weaker. Above, 10 grams of part ‘B’ has been added. It is always important to think ahead when preparing for this work! Make sure that you have all your necessary tools etc. to hand .. i.e. as here, a mixing stick .. so that you don’t have to hunt around for them at short notice. As soon as the part ‘B’ is added it should be quickly stirred in because the reaction will start within a few seconds. If the mixture needs to be decanted into a form mixing should not be more than c. 10 seconds before transferring it. I’ve tried mixing the material directly in the mould form a few times in the past but this has often resulted in an uneven result with parts not properly curing. The foam will have fully risen within about 5-10 minutes. Out of interest I calculated exactly how much it had done so in this case. There was 17g of part ‘A’ .. so 17.85ml in volume using the above calculation, and 10g of part ‘B’ being 11.3ml in volume .. altogether 29.15ml. The foam rose to fill the cup with a little more on top so by measuring water in the cup and adding a little I estimated 210ml. So the polyurethane had actually expanded to 7.2 times its original volume! I don’t know whether the increased expansion was due to the age of the material or the fact that I added a touch more part ‘B’ .. but it’s worth experimenting with! When I bought the foam in 2012 it was for making these forms shown below (I’ve placed an old casting in its mould) .. and I recorded at the time that the polyurethane only expanded 4.5 times its volume. The mould is plaster-jacketed silicone rubber (made a long time ago when I was living in Hamburg and I can’t remember why I used a translucent silicone). The silicone doesn’t need any release agent against the foam but plaster certainly will if you want to keep it clean .. and Vaseline will be fine. The surface of the cast didn’t achieve the smoothness of the mould .. but one shouldn’t expect it to. What this photo shows well is how much polyurethane discolours over time. In this case it was just discolouration though .. after three years exposure the feel of the surface was just the same. Tiranti’s Rigid Foam 002 £37.88 per 2kg (Tiranti 2017, inc. VAT). 2 parts mixed 1:1 by weight. Expands up to 8 times, tack free in 10mins and demould in 15-45mins. This can be used as a fill material for hollow castings, giving extra strength without adding to weight. I have a fibreglass mould of a ‘life like’ mannequin and would like a polyurethane cast. 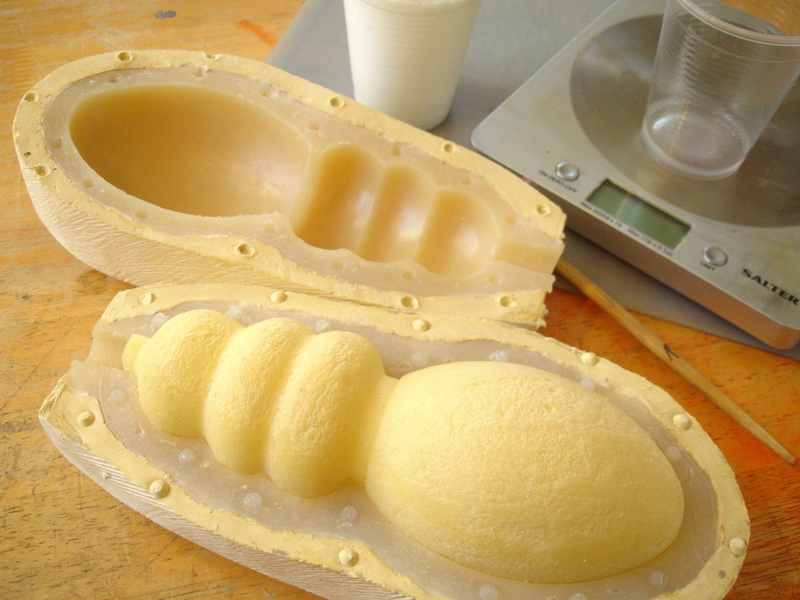 However, because of the size of the mould, I cannot mix sufficient volume of polyurethane liquid in time to fill the mould. Could you advise what I could do to get around the issue of the mix curing before pouring please? Are you being serious? Have you over £1,000 or equivalent to spare for that amount of PU resin? In practise objects of this size are always hollow, and most often these days in fibreglass. It is possible to do this even in fibreglass moulds with the right barrier agent. 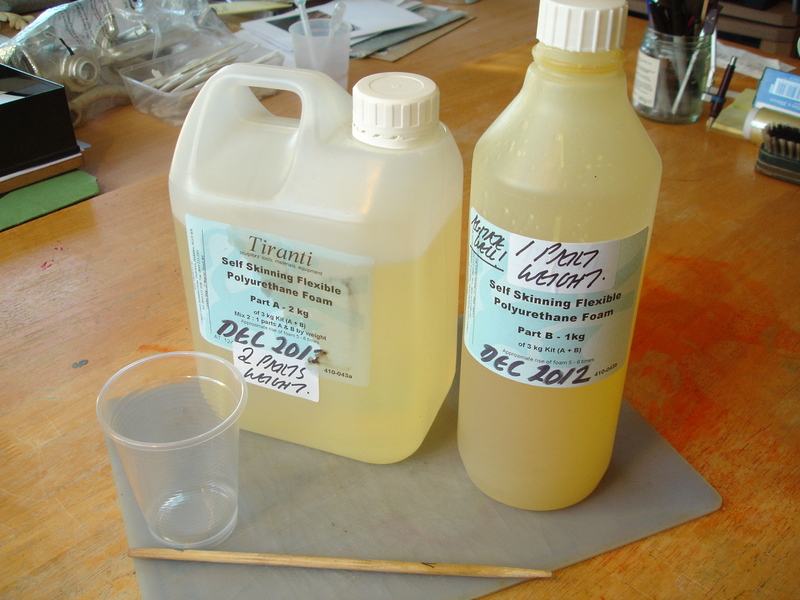 Filling large volumes with PU resin, when its done at all, can only be by mixing smaller amounts and filling bit-by-bit. I just tried something similar with the DIY type aerosol product. It failed but I think I know why. The product both expands and cures due to exposure to moisture. I stuck the long tube you get on the aerosol can into the bottom of the mould and sprayed WAY too much product in there…as a result it had no room to expand and excluded all the moisture. I’ll do some more tests but I think if I withdraw the tuibe pretty sharpish as I squeeze the trigger, it should give results similar to yours. Hi David, I am due to start a degree course in Modelmaking in September. I understand you’re busy but I would appreciate some advice on a project I am working on. I am building a habitat for my turtle. When designing his basking area I designed a box to hold sand but quickly realised it wouldn’t work as it can get very messy as he goes in and out of the water. I am searching for a substitute. I want the material to be soft or cushioned underfoot when cured and dry. I am looking at the cushioned version of the Polyurethane Expanding Foam, Polyurethane Resin and Epoxy Resin. I am not sure which one to go for. I would like to add some sand as a filler to get a sand effect surface. The important thing is I need this surface to last for a long, long time, (he is going to live for at least 40 years). I will be protecting it with a seal, probably epoxy and will do this as often as needed. I don’t care about colour degradation, only that the surface remains intact even with a turtle walking on it over a long period of time. It is going to be exposed to direct heat and artificial sunlight. I was just wondering if you have any idea of which material I should use? Yes, it sounds like you want a soft ‘self-skinning’ polyurethane foam (I don’t think there is an ‘epoxy’ one .. certainly never heard of it). Something like this one .. http://www.mbfg.co.uk/foam-materials/foam-soft.html But I have my doubts about using something like this! Firstly polyurethanes can degrade noticeably under normal UV light; I can’t vouch for how long the foam might cope with the ‘abrasive’ parts of your average turtle (no personal experience, just imagining!) and thirdly, I’m not sure about ecotoxicity. Have a look at the Safety Data Sheets on that page .. especially for Part B. Maybe you can make sense of them. Better still (maybe) I would contact MBFG if in doubt. It may be fine, but personally if it were my turtle I’d much prefer to find some ‘organic’ solution like .. even if it were using fine aquarium ‘gravel’ instead of sand (surely less messy) or even having some kind of net covering over it to keep it in .. sort of like making a ‘bean-bag’ terrain?